"Daniel was born hungry," Colleen said. "I had to learn to be hungry." 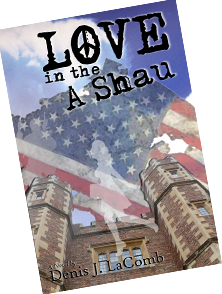 “Love in the A Shau” is the story of driving ambition and passion set in the turbulent 1960s. Daniel, a struggling college freshman, has nothing. Colleen, a daughter of wealth, has it all. Both fight society’s prejudices to find themselves and an everlasting love. This untypical love story explores class in America, Vietnam, old world values, and family traditions that collide with women’s newly emerging roles in society. I remember several strong independent women like Colleen in the 60s. It was fun reading and re-living her experiences if only vicariously. Class exists in America. It did then, it does now. Love in the A Shau shows that love can cross any class difference. This story is relevant even today. Men go off to war and return to uncertainty and sometimes lost love. It broke my heart to finish this book, it was that good. The story will captivate you. An excellent read.